representatives of the participating distributors had the opportunity to evaluate the more than 100 exhibiting manufacturers according to various criteria at the DISTREE EMEA event. In recent years, the event has developed into a very important event especially for managers in the distribution sector and is regarded as an indicator for future developments in the market. 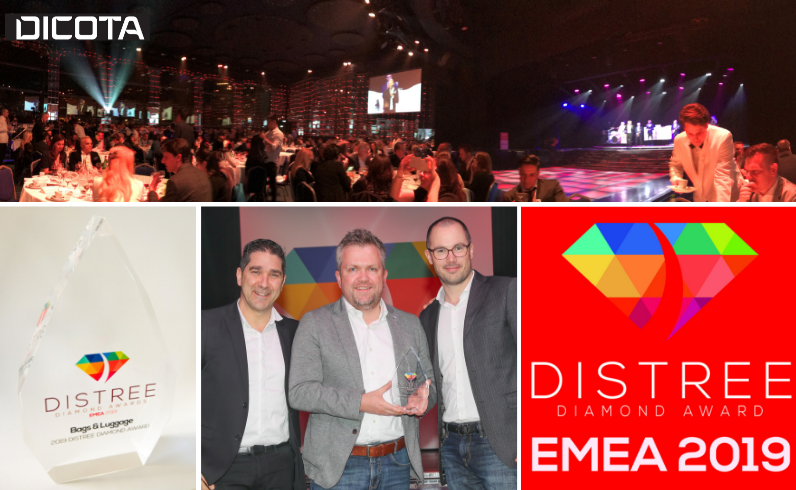 As a manufacturer of carrying solutions and accessories for notebooks and mobile devices, we have received a DISTREE Diamond Award from industry experts and distributors for the third time in a row. At this year's award ceremony in Monaco, we received the award in the "Bags & Luggage" category, as in the previous year. The DISTREE EMEA event has become a fixture in our calendar as an important, international channel event in the first quarter of the year. We are very pleased about this and are proud to be among the prize winners again at this top-class event. For our entire team, this is a great honour and motivation to continue presenting our customers with the best possible quality and innovative ideas in the future. We have used this year's event to focus on our new ECO product range made of recycled materials. For us, the award is therefore also a clear confirmation on the part of the industry that sustainable products are in demand. As we regard sustainability as a central corporate value, we have been using recycled materials for many years and will continue to expand this focus.